Social learning has been much discussed over the last few years. There seems to be a wide consensus that social media can contribute substantially to organizational learning efforts. The acceptance of informal learning as a major contributor to employees' competencies has brought about several fascinating methods and tools that facilitate and encourage the internal conversation and collaboration, which are the essence of social learning. Instructional designers are obligated to shift from an ADDIE mindset to a 70:20:10 one, from designing the solutions to facilitating them. The fundamental challenges of the profession become even more concrete: how do we set up the framework, how do we encourage learners to socially engage with each other within a specified framework? (LinkedIn, Facebook, Twitter, Skype and others. )One instructional design group from a mobile provider enterprise in Israel decided to launch a social learning game within the HR division to stimulate internal conversation and collaboration. This was to be a preliminary project with the aim of establishing the grounds for a continual social learning effort. The mobile enterprises choose a combined mobile and PC application provided by Wheeldo, a social gaming provider. One of the social learning game objectives was "to get people to smile and connect," says the instructional designer who initiated the project. 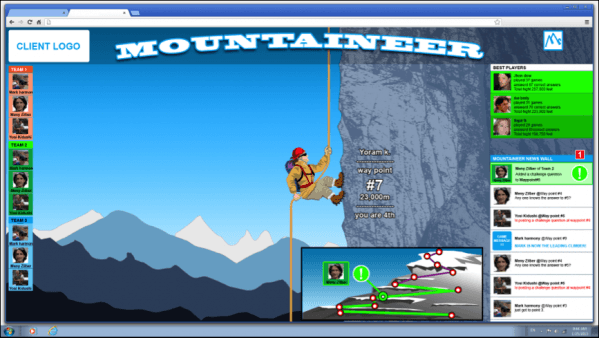 The social learning game template chosen is called "Mountaineer" (see figure 1). The climber can either gain altitude or lose it in response to the player's accuracy in answering randomly presented questions. In this social learning game, the players are the ones also creating the questions for the group. Over the period of a single week (including the weekend), 35 employees were engaged in the social learning game, mostly using their own mobile devices. The theme was employees' personal details, for example: what is Dan's favorite football team, or how many children does Lisa have? Points were awarded for creating questions, for answering peers' questions correctly and for the number of attempts to answer questions uploaded by the user (the harder the question, the more points were gained). As in all Wheeldo social learning game a template, a social arena is displayed at all times, allowing each player to view his social learning game status in comparison to others and watch recent actives in the social learning game. After a few days, the 35 players had created a total of 500+ questions and the social learning game became the most popular topic of internal conversations. "We achieved everything we have hoped for and beyond," says the instructional designer. "We are now ready to facilitate game based social learning for our internal learning and business needs with full confidence that the method and tools will fulfill the promise of social learning." Social learning holds the key to contemporary competencies challenges. The shift from formal or traditional means to social ones is our challenge as instructional designers. Using a semi structured social means such as social learning games can help make an effective shift for designers and the entire organization.